It’s always exciting when there’s a new version of the iOS system for iPhones and iPads. New features! New icons! Better performance (hopefully)! But what happens when things fail and your phone freezes up in the middle of an iOS update? Before you even start any sort of device upgrade, you should always ensure that you have a solid and reliable backup, that your device is fully charged and that it’s plugged in and you can leave it alone for an hour or longer. Even with those safeguards, sometimes things still don’t work quite right and that’s why it’s smart to know before you panic how to deal with the situation. And one good solution to ensuring that you can always recover your iPhone to a functional state even if the update fails is PhoneRescue. In this instance we’re looking at “iOS Repair Tools“. Notice on the lower right it lists among the common scenarios “iOS upgrade failure”. Yup, that’s what you’ll want if things don’t work properly. I encourage you to start with Standard Mode and let the software do the hard work of figuring out what’s going on. If that fails, back up and try with Advanced Mode instead. Another arrow click and you learn that you need to put your phone into what’s known as Recovery Mode. It’s a failsafe mode that you really shouldn’t ever need to use, but when things go south, well, it’s good to know Apple planned for this contingency. The instructions for getting into Recovery Mode are different for each model of the iPhone, but PhoneRescue will show details for your own phone here, so no worries. Before we’re done, though, let’s have a quick look at the “Recover from iOS Device” area as that’s darn interesting too, a chance to see just how much information is on your iPhone and what PhoneRescue can salvage or restore. 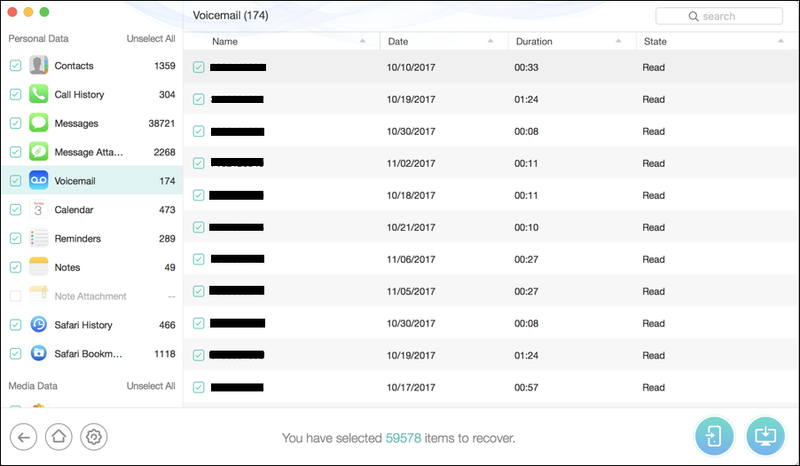 You can choose a specific category to recover or restore (note that this is also one of the very easiest ways to grab all your voicemail messages if you want to share or archive them). Click “OK”. Notice on the left side, however, that it’s counting and tallying up as it proceeds. Cool. If I have PhoneRescue recover everything from my iPhone X that’ll encompass 59,578 items. Sheesh. That’s a lot of data and stuff! The more important point isn’t that you can grab your voicemails, of course, though that’s good to know. The important thing is that if you’re upgrading your iPhone or iPad to iOS 12 and something goes wrong, you’ve got an app you can grab to help recover your device, your data and generally get everything back to full functionality! PhoneRescue can be downloaded from iMobie.com and costs $49.99. Check out their iPhone Data Recovery guide too. Disclosure: This post was sponsored by iMobie and is intended to help you survive the great iOS 12 update. FIIO BTR3 Bluetooth Headphone Amplifier - Reviewed! © askdavetaylor.com. All rights reserved.